This easy, festive and tasty treat is fantastic with a cup of coffee or tea anytime of day. I’ve never eaten so many Slices, Bakes, Biscuits or Cakes before Ballymaloe. Having tea is a natural part of daily life here and always includes some type of delicious morsel – the hard part is trying not to pile up one’s plate. Preheat oven to 350°F. In a 10×7 inch swiss roll tin grease lightly with sunflower or similar oil. Put butter, castor sugar, eggs and self-raising flour in a food processor. Pulse just to blend. Spread evenly in swiss roll tin and bake for 20-25 minutes or until golden brown. Cool. 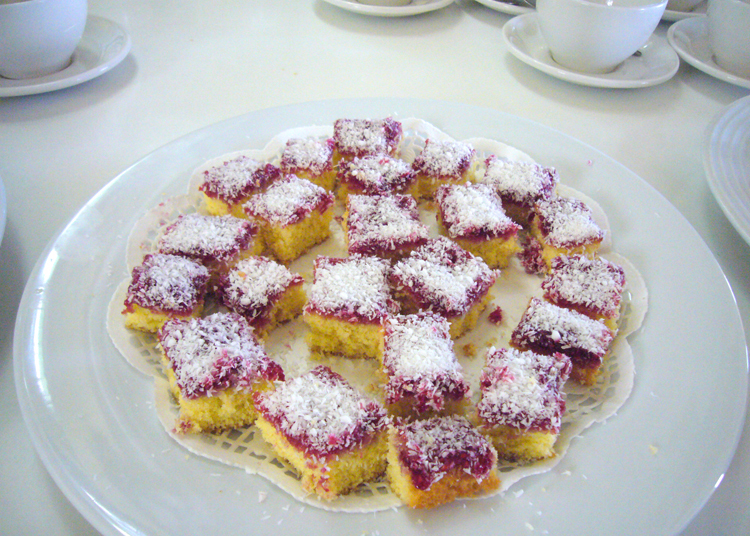 Spread the top with raspberry jam and sprinkle with coconut. Cut into 1 inch squares. Store in airtight container if you have any leftover! This entry was posted in recipes, sweets & desserts by MixedSoup. Bookmark the permalink.